CREATE YOURSELF YOUR CERTIFICATES OF AUTHENTICITY! The value of a Certificate of Authenticity comes from the notoriety of the person who writes it (the artist, and art expert, etc. ), because the certificate is recognized at the time of writing by all professionals. The Certificate of Authenticity is the indispensable key to maximize the sales of your work. Without it there is no estimate, no transaction, no movement, nor recognition in a recognized catalog of the financial value of the work. ARTcertificate proposes to artists and art galleries to create themselves the certificate of authenticity that will accompany the work with BONUS a traceability service by QR code accessible by mobile phone or tablet. * Layout customization and creation of a template. The signature of the writer is compulsory on the Certificate of Authenticity. A security hologram or bubble code is recommended, but not essential. - Access to the creation of a Certificate of Authenticity: Paintings, sculptures, photographs. ARTcertificate has developed a layout system for Certificates of Authenticity that allows anyone who is not a computer expert to quickly and easily compose the layout of a Certificate of Authenticity. 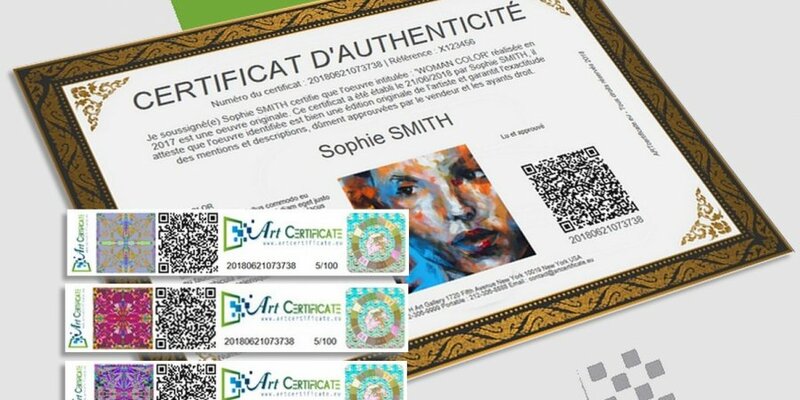 - Each Certificate of Authenticity is issued with a QR code, in order to easily locate the work of Art on ARTcertificate. The QR Code is an international standard that helps smartphone users to easily access on-line information. Free applications (such as I-nigma or NeoReader) allow tusers to scan a QR code and instantly access a web page dedicated to the work of Art. - This SECURE QR code identifies and creates the link between the Certificate of Authenticity and the corresponding work of Art. - This service is provided FREE OF CHARGE with a purchase of a Certificate of Authenticity. ARTcertificate GALLERY is a FREE space to promote your work of Art. Visitors can view the details of each of your creations (title, dimensions, media, etc. ), as well as your artist profile. Visitors can browse through other works of art you have made public in the ARTcertificate GALLERY.